Graves Motorsports Full Stainless Steel Exhaust System for the 2018 Kawasaki Ninja EX400 with titanium silencer. GMS Exhaust systems are designed for the elite rider seeking top of the line performance, fit, finish and value. 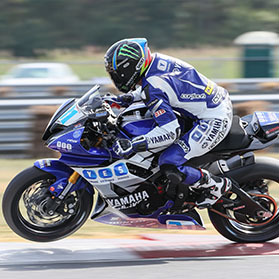 This EX400 exhaust system was developed using the same technology that has powered the Monster Energy Graves Yamaha team to 8 AMA / MotoAmerica Superbike championships and numerous 600 championships.This product is intended for closed course competition use only. Use of this product for any other purpose is strictly prohibited. 10% increase in horsepower and torque with this exhaust and tuned (we suggest the FTEcu tuning kit). New Diamond Shaped Silencer Design (Titanium Can with Carbon End Cap and Titanium silencer rivet bands), configured to balance the EX400's body lines and produce the best balance of power.